The pediatric neuro-oncology research laboratories are under the direction of Dr. Mark Souweidane, who is currently investigating interstitial infusion for pediatric brain tumors, and Dr. Jeffrey Greenfield, who is investigating genomic sequencing and personalized medicine. Dr. Souweidane's laboratory is under the daily direction of Uday Maachani, PhD., and includes a team of technicians, fellows, and medical students to move the research forward. A major limitation in treating pediatric brain tumors has been the ability to achieve adequate levels of a therapeutic agent within the tumor, due to the presence of the blood brain barrier (BBB). A major advance in the field of neuro-oncology has been the introduction of local delivery schemes, which administer therapeutic molecules directly into the tumor. Interstitial infusion, also called convection-enhanced delivery (CED), is a local delivery system that has been investigated in Dr. Mark Souweidane's laboratory as a potential form of therapy for children with inoperable brain tumors. Find out more about Interstitial Infusion/Convection-Enhanced Delivery research. Weill Cornell is also a member of the Children's Oncology Group and is participating in a worldwide protocol to collect, bank, and study brain tumor tissue and blood samples from children and adolescents. More about the Children's Oncology Group project. Dr. Greenfield's laboratory team is managed by Prajwal Rajappa, M.D., and Yujie Huang, Ph.D., and also includes technicians, fellows, and medical students. There are many different types of pediatric brain tumors, and many variations even among a single type. The fast-changing field of genomics holds the potential for "personalized medicine," in which a treatment will be tailored precisely for the individual patient and the tumor type. Dr. Greenfield's team focuses on how to use genomic sequencing to identify the best therapeutic agent for inoperable pediatric brain tumors. Find out more about our research into genomic sequencing and personalized medicine. With the best medicine to attack a tumor, and the most efficient methods of delivering that medicine directly to the tumor site, we hope to create new models for targeting and destroying tumors we cannot reach surgically. Find out more about the Children's Brain Tumor Project at the Weill Cornell Pediatric Brain and Spine Center. Dr. Souweidane and Dr. Greenfield rely on the generosity of supporters to fund their research laboratories. Find out how to make a donation to further research. 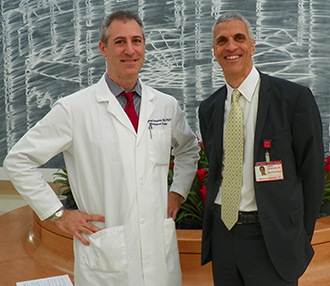 Top: Dr. Jeffrey Greenfield and Dr. Mark Souweidane run the pediatric neuro-oncology research laboratories. 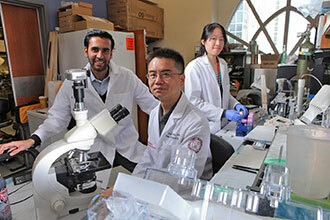 Center: Medical student Ranjodh Singh, Dr. Zhiping Zhou, and technician Sharon Ho in Dr. Souweidane's lab. 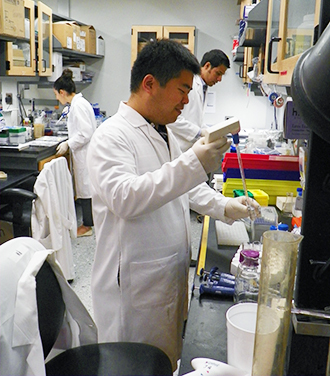 Bottom: Dr. Karen Badal, Dr. Yujie Huang, and Dr. Prajwal Rajappa in Dr. Greenfield's lab. The generous gifts of our supporters allow Dr. Souweidane and Dr. Greenfield to continue their critical work researching pediatric brain tumors.